Very well-deserved. Click "Read More" to see pictures from the event. Janet has been a member of our Club for over 28 years, and was president in 2013-2014. She's an incredible woman who really knows how to get things done and make amazing things happen! Not mentioned in this article is her unwavering dedication; when Janet takes on a project, you know the outcome will be outstanding. Children's Fest continues to grow every year in large part because of Janet's commitment (the fest will be celebrating it's 25th year this September!). 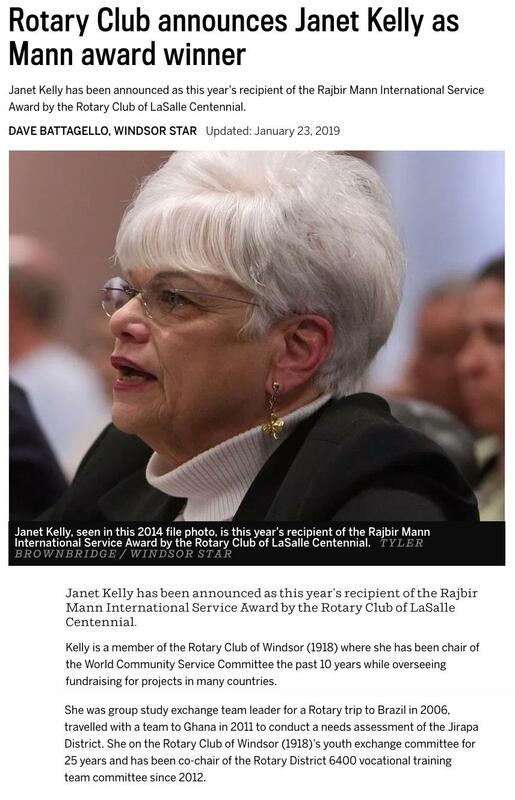 Most recently, the Centennial Legacy projects, including the Rotary Club of Windsor (1918) Centennial Hub - connecting Windsor/Essex trails - and the Centennial Plaza, lovingly referred to by our Club as "the crowning jewel" of our Centennial, would not have been what they are without Janet Kelly's driving force. Our Club is proud to have Janet as an instrumental member and leader. Huge congratulations!